Hi. My name is Ealasaid, and I’m a bibliomaniac. Yeah. I have kind of a lot of books to read. A total of 175, actually, I just ran and counted. Plus the 10 books I’m reading right now (ten, wtf, that’s a little ridiculous, even for me), and a small handful of comics. I own more unread books than some folks’ own books, period. Sheesh. A while ago I tried instituting a sort of half-ban on buying books. 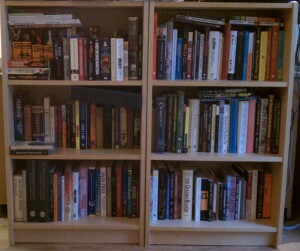 I decided that for every 20 books I read and removed from my to-read shelves, I would allow myself to buy a few books. Not too many. It didn’t work. See, I included a loophole for authors I collect and subjects I collect, and I could make a justification for almost anything. Plus, at that point people tended to give me books or bookstore gift cards for presents. The only reason I have fewer than 200 books on those shelves is I did a purge a couple months back. Any book I wouldn’t be willing to buy if I didn’t already own it went into the get-rid-of pile. It wasn’t easy. And, well, almost immediately after doing it, I went to Powell’s Books up in Portland and dropped about $300 on another 21 books. I sometimes joke that I’m doing better than I did back in college, when I had a $30/week habit, year in, year out. The college and university bookshops were my Kryptonite, man. So many awesome books! I briefly considered doing some kind of similar ban to Kyeli’s, but quickly decided not to. I don’t do resolutions for New Years, and that kind of flat out denial doesn’t come easily. I am, however, making a conscious effort to read more. Yes, I probably already read more than the vast majority of Joe Schmoes, but I don’t read as much as I wish I did. I love reading and I have spiffy new reading glasses, so I’m’a get my read on in 2011. 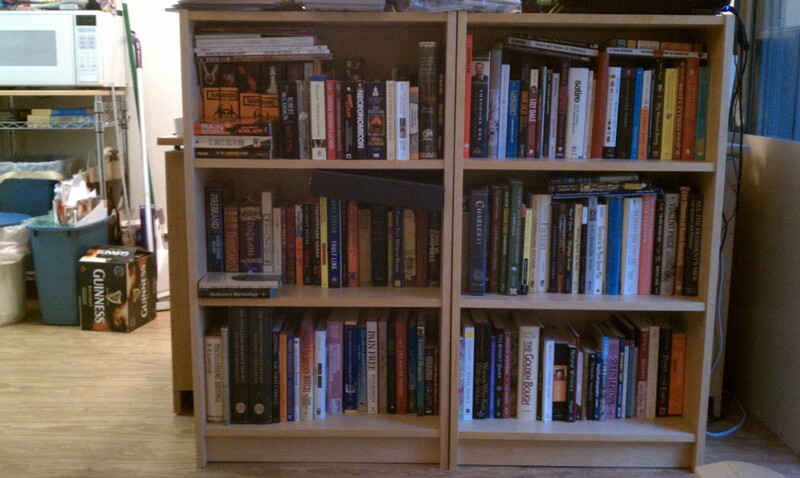 No specific goals, just the intention to churn through the unread shelves a little. How many unread books do you have as we start the new year? This entry was posted in Hangin' out Backstage and tagged bibliomania, reading. Bookmark the permalink. 4 Responses to Hi. My name is Ealasaid, and I’m a bibliomaniac. I have been counting a lot of professional how-tos and other nonfiction related to my profession as unfinished books. But recently I decided to stop doing that, because I read as far as I need to for where I’m at with my projects. So, armed with my new Kindle, I’m now letting myself indulge in a range of fiction and whim-induced book purchases. I got a few magazine subscriptions, too. This brought me right back to my student days of blowing my grocery money at the used book store and then buying ramen noodles to get me through til Friday. I don’t know how big the to read pile is, mine is somewhat virtual, but a couple of years ago it was a physical pile with about 25 books in it. Most of which I’ve still not read. I am in the middle of four books, no, make that five. I think my to-read pile, though, is about 4 books long as well. I try not to go to bookstores too often, because of how expensive it ends up being! The last 4 books I bought were Terry Pratchett books for my sweetheart recovering from a really nasty virus, so they read them and were happy. And who do I have to thank for Terry Pratchett? YOU! Because you introduced me to his books! Thank you for that! Any more like Pratchett out there? I could be persuaded to try a new author! All my new books are the ones required for my college classes, but I want to read them anyway. They’re books like: “Fast Food Nation” “Stumbling on Happiness” (just finished that one finally, “Emotional Intelligence” etc. I’ve cut back on book purchases because of the lack of money and the lack of time for personal reading, but I’m sure there is a whole box of books somewhere in storage that I haven’t read yet. It’s times like these when audio books are a real godsend. I still count them as reading, do you?